Stephen Mardigan enters the federal courthouse in Portland on Tuesday. 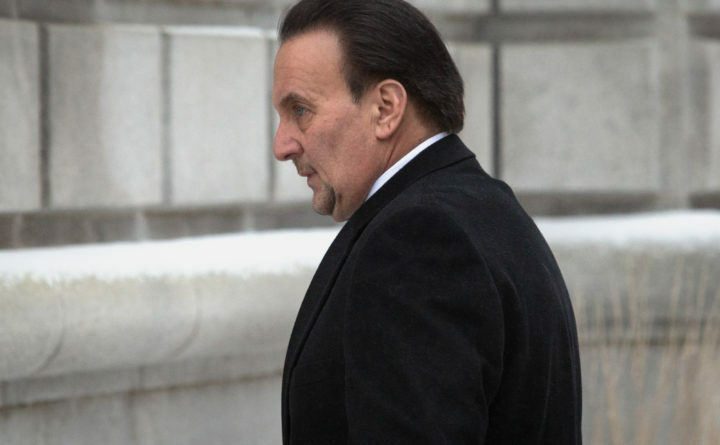 PORTLAND, Maine — The man at the center of an illegal sports betting ring in Maine’s largest city was sentenced to 15 months, plus three years of supervised release, Tuesday afternoon in federal court. In May, Stephen Mardigan pleaded guilty to charges of gambling, money laundering and filing a false tax return. Last month, U.S. District Court Judge Jon D. Levy ordered Mardigan to forfeit 18 Greater Portland properties, worth a total of approximately $13 million, as well as more than $1.1 million, as part of the case. Mardigan, 62, was also ordered Tuesday to pay $1.3 million in restitution to the Internal Revenue Service. Levy’s sentence Tuesday was less than the 21 months recommended by prosecutors from the U.S. Attorney’s Office, but more than what Mardigan’s attorney, Bruce Merrill, asked for. Merrill argued against any prison time, downplaying the seriousness of gambling, calling it “part of Americana” that — in the form of the lottery and casinos — is often sanctioned by the state. Forensic psychologist Dr. Charles Robinson testified on behalf of the defense, telling the court Mardigan suffers from a gambling addiction. Mardigan’s sister, Leslie Poulin, also testified, saying her brother helps care for their elderly and ailing mother. An emotional Mardigan addressed the court, saying he has attended Gamblers’ Anonymous meetings since 2017. “These past 20 months have been a terrifying and humiliating experience,” he said. Levy said he received 59 letters supporting Mardigan from family, friends and business associates. For at least 14 years, Mardigan took bets on professional and college football, baseball, basketball, car racing and golf, according to court documents. Gamblers called either his cell or home phone and placed wagers between $30 and $10,000. Investigators estimated Mardigan made between $9 million and $12 million over more than two decades of sports gambling, with his two largest bettors paying him nearly $4.4 million in gambling debts between 2009 and 2016. The FBI tapped his phones in the spring of 2017 and overheard 17 people placing $190,000 bets, court records state. Agents later identified another 10 gamblers from betting sheets seized from Mardigan’s home. “He was able to live a lifestyle based on this illegal activity that, quite frankly, few in this area do,” he told the court. The judge noted there was no testimony or bank statements from bettors saying they could or could not absorb the gambling debts, but said he was skeptical that no families were affected by their “secret” financial losses. And while he commended Mardigan’s attendance to his apparent gambling addiction since the FBI raids on his properties nearly two years ago, Levy said Mardigan also spent years profiting from the criminal activity without any effort to change his ways or seek help. During his three years of supervised release, Levy ordered Mardigan not to open any lines of credit without the approval of his supervising officer, to report any earnings to that officer and to undergo any treatment directed by the officer. Mardigan ran the business out of his house at 460 Baxter Boulevard and a used car dealership on Forest Avenue to manage payments to and from gamblers, according to court filings. In October, accomplice William Flynn, 77, was sentenced to two years of probation, including 90 days of house arrest, for helping Mardigan run the illegal betting ring. He also forfeited $75,000 in the case.